There’s no better way to spend any day of the week than outside in the warm sun next to a sparkling swimming pool. Whether you’re alone or with friends, taking a dip in your very own pool is relaxing and fun. If you frequently daydream about spending the summer in the refreshing waters of your own pool, why not install one in your backyard? Pools offer a wide range of benefits from exercise to social events – and here are five reasons you need a swimming pool in your backyard. A swimming pool isn’t exactly a cheap addition to your home, but according to US Bank they can add value to your property. If you ever sell your home, your pool will be an attractive feature that catches prospective buyers’ interest, especially if pools aren’t common in your area. According to statistics from the National Association of Realtors, a pool adds approximately 7.7 percent of a home’s value. That could bump up your home’s resale value by thousands of dollars. 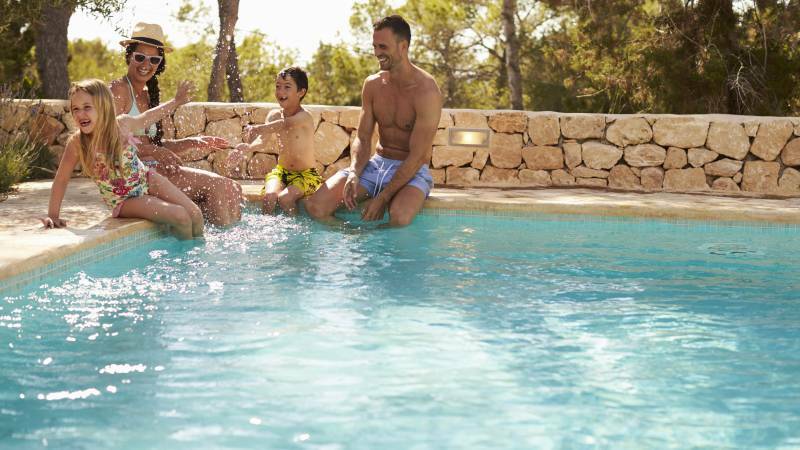 Although not all homeowners want to deal with pool maintenance, a pool is an appealing addition to a home for some families, especially those with children. If board games and movie nights are starting to get stale as family entertainment, a pool might be the upgrade you need. Pools provide an excellent way to encourage your family to spend time outside together. There’s no shortage of games you can play as a family in the water, from scavenger hunts to jousting on inflatables. Even after your children outgrow pool games, kids and adults alike will still enjoy swimming and relaxing in your backyard pool. A pool provides the perfect social centerpiece for gatherings, whether it’s just your immediate family or a lively party. Swimming offers a full-body workout that can help you burn calories and tone muscles, Fitness magazine reports. It’s also a great workout for people who aren’t already athletes; you don’t need any special tools or equipment, just the motivation to get in the pool regularly and complete a few laps. Swimming is also an excellent workout for people with joint issues. Doing simple exercises in the water puts little strain on the body when compared to other high-impact exercises, such as running, sports or biking. Frequent dips in the pool can also help your mental health. While you’re calmly floating in the pool, your worries can melt away in the refreshing waves, leaving you feeling relaxed and ready to face life’s challenges. You don’t even need to get into the pool to help soothe your mind; just watching and listening to the waves from a nearby chair can help calm you. If hosting gatherings is one of the highlights of your summer, adding a pool is a surefire way to encourage your guests to attend regularly. Instead of having a party just for eating food and sitting around, a pool encourages everyone to move and be active. For guests without a swimming pool, attending a pool party is extra exciting, especially for children. Your pool makes an obvious focal point in your yard, drawing your guests together to have a good time. With a few other additions to your backyard, including an outdoor kitchen, you might find it difficult to get rid of your guests, even long after the sun has gone down. On a hot summer day, sitting outside in the afternoon and evening can be unappealing, even in the shade. With access to a pool, however, you have an excellent way to enjoy the fresh air while feeling cool and relaxed. Taking a leisurely lap around your pool can help you feel cool immediately. This is an especially nice option if you struggle to keep your home comfortable on a particularly hot day. It’s also a great way to get a workout in when it’s too hot to go running or biking. If you’re ready to consider installing a pool at your house, you might wonder how to save money on the installation. Fortunately, there are a few ways to save money on this expense, starting with the design of the pool. A small pool costs less, according to Pool Pricer, than a large pool and choosing a simple design without curves and other extra features will save some money. The materials used in your pool affect the price as well. Of course, the best way to save on a swimming pool is to do your homework. Research ways to cut costs, and make sure to search online to get price quotes and estimates from qualified professionals. You might even find that new customers are offered special deals or incentives, or that certain types of pools come with a lower price tag. Careful research online is the way to ensure you don’t spend too much. Upgrading a boring backyard with a pool is a great way to encourage your family to spend more time outdoors. You’ll also reap other benefits, including an increase in the value of your home. A little bit of research and looking at existing pools can help you find the right pool for your yard. Interested in building a swimming pool? Start a search today.